Parable of the 10 Virgins, Matthew 25, Future or AD 70? February 2nd, 2009 07:00 AM | by William Bell | Parables. day and hour of his return. Futurists believe Christ has not yet returned. They yet look for that coming to be fulfilled. to support a future coming.However, we will note supporting evidence that the parable of refers not to our future but to the Lord’s coming in 70 AD. The major point of the parable is that 5 wise virgins prepared themselves by taking oil in their lamps, while the 5 foolish ones did not. This lack of preparation created the conditions for emphasized the need for and lack of preparation. The relationship between Christ and the church is often styled as a wedding to be consummated. See 2 Cor. 11:2, where Paul says he espoused the church as a chaste virgin to be presented to Christ. The espousal is the pre-parousia period of waiting for the bridegroom. Other texts which address the marriage are: Matt. 22:1–8; Rom. 7:4; Eph. 5:27; Rev. 19:7; 21:9. The parable creates the condition for preparedness. This is done by the action of sleeping. The attention on sleeping serves to indicate that during this act, one is not consciously aware of what goes on in the world outside of that realm. 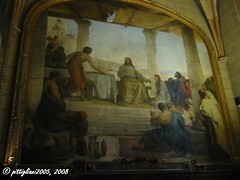 When Jesus rose from the dead, the Jews paid the Roman soldiers to say that Christ’s body was stolen while they slept. First, the soldiers were not asleep. Had they been sleep, they would not have known how the body came to be missing. Likewise, in the parable, to be sleeping simply indicates that the disciples did not know the day and hour and were to be vigilant in their preparation. Then at the least expected hour, the bridegroom came. The 5 foolish virgins had no oil in their lamps and were unprepared for the wedding. The wise virgins were ready and went in with him to the wedding and the door was shut. Observe that the church (represented by the wise virgins) arise and trim their lamps yet in expectation of the bridegroom. Nothing in the parable indicates that they are raptured to heaven leaving the foolish virgins behind on earth. Further it is understood that the eschatological wedding follows the millennum (1000 years) reign of Christ. What we are viewing in the parable is the second coming at the end of the millennium. The significance of this is that no separation and Rapture occurs from the time the wise virgins fill their lamps in preparation and the time of the coming of the bridegroom. Both wise and foolish virgins remain till the coming. This is similar to the parable of the tares where both wheat and tares remain in the field (world) until the time of the harvest, i.e. the second coming. After the bridegroom unexpected return, the wise virgins having gone into the wedding, the foolish ones knock at the door seeking entrance. They cry, Lord, Lord, open to us! The Lord says he does not know them. The parable then offers the main point of readiness in preparation for the coming of the bridegroom, i.e. the coming of the Son of Man in which they knew not the day or the hour. Lessons From The Parable Which Apply To AD 70. First, the marriage of the bridegroom occurs after the city is destroyed, per Matt. 22:1–7. This follows the same pattern as that found in Revelation 18 and 19, when the harlot city, Mystery Babylon is destroyed. Secondly, the parable occurs within the lifetime of the same virgins who took the oil. It is not an event which begins with one generation of virgins and ends 20 centuries later with another group of virgins. Since it is not true that these virgins could have lived almost 2,000 years, it makes the point that “all these things” would take place before that generation passed away. This shows the unbroken link between Matthew 24 and Matthew 25. Thirdly, the idea of “shutting the door” marks the time of judgment. In keeping with the first century context, Luke shows to whom this language is addressed. Jesus’ ministry involved teaching in cities and villages in Palestine, mostly Galilee and in Jerusalem. When he arises to shut the door, as indicated in the parable, many stand outside and knock saying Lord, Lord open to us. The point is that it is the same generation who charged him as a glutton and winebibber who ate with sinners and in whose streets he taught, that were shut out when they arose to enter at the time of the judgment/wedding. Therefore, the parable of the 10 virgins, Matthew 25, is but a continuation of Jesus’ discussion of the destruction of Jerusalem in Matthew 24, all of which occurred before that 1st century generation passed. To learn more about the Second Coming in AD 70, get a copy of our book, The Re-Examination. You may order over our secure server. Click here now to order. « Armageddon: Are You Seeking an Escape Route?